ProQuest has now announced new functionality for its 360 Link link resolver, improving the research experience by delivering superior full-text access to discovered content in a library’s collection. 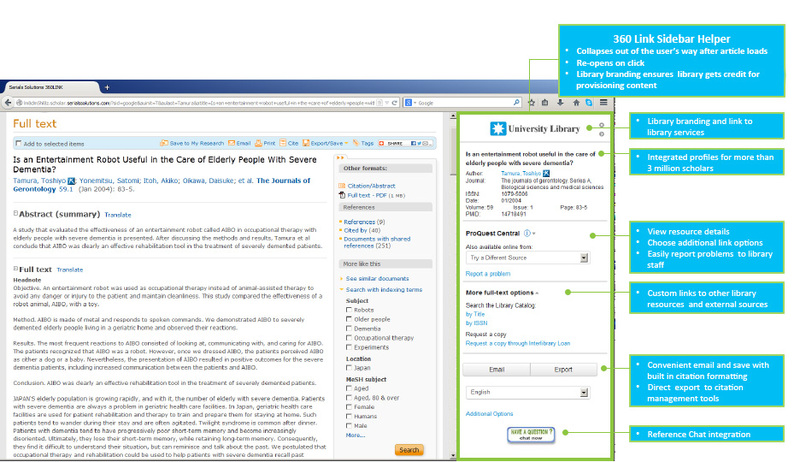 360 Link now utilizes Index-Enhanced Direct Linking (IEDL) technology in combination with a new Sidebar Helper frame, giving libraries the opportunity to further assist patrons at the point of need. Currently in Beta and available at the end of July to all 360 Link customers as part of their subscription, the enhancements were developed in close collaboration with four customers: Bowling Green State University, Cornell University, Duke University, and East Carolina University. 360 Link with IEDL technology and the new Sidebar Helper frame provides the most direct and straightforward access to full-text, and responds to more than a decade of unmet user expectations with traditional link resolvers. Whether searching in a discovery service, Google Scholar, A&I database, or any other popular platform, researchers will experience more reliable and direct access to full-text, compared to OpenURL link resolvers.